Over the weekend more than 4,500 people around the world took the opportunity to visit MBAC and take a little look around our lobby thanks to virtual tour technology offered by Tourwrist.com. The site offers virtual tours of interesting locations via the web or via their free mobile app. You can view the MBAC tours at http://www.tourwrist.com/tours/24022. Using a wide angle lens and a special tripod mount, former MBAC Instructor Paul Lang (paullangphotography.com) submitted several VR tours of MBAC including the MBAC lobby, patio area, boat house and solar array. Once the photos are submitted and run through special software users can virtually tour the center. That is, they can actively look 360 degrees around the room, as well as up and down, and as if they were standing there in person. iPhone and iPad users who download the free Tourwrist app can actually hold their devices out in front of them, and rotate them around and up and down to have a virtual window to the tour. 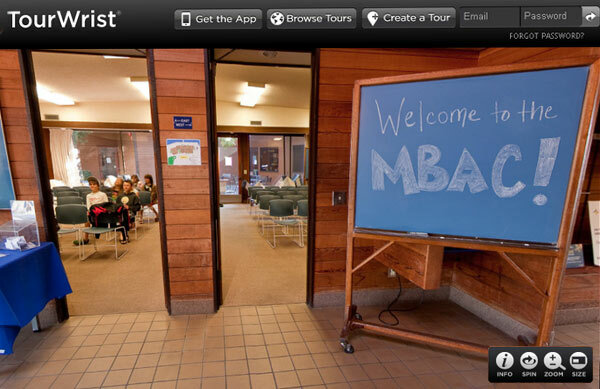 The MBAC lobby tour was featured as a “Tour of the Day” on the site, which is what led to the high number of visitors from all corners of the world.